Provide comfort for the family of Sandra Chandler with a meaningful gesture of sympathy. 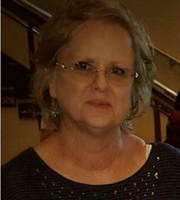 Sandra Chandler, 63, died Friday, April 12, 2019. Graveside service for Mrs. Chandler will be held at 11 a.m. Monday at Fort Chadbourne Cemetery in Bronte with the Rev. Reid Johnson officiating. The service will be under the direction of Miller Family Funeral Home. Visitation will be held from 5-6 p.m. Sunday at the funeral home. Mrs. Chandler was born on Aug. 16, 1955 in Pecos to Billy Frank and Dorothy (Cotten) Moore. She married Randy Chandler on Oct. 28, 2004 in Snyder. She loved her family, sewing, traveling and Texas bluebonnets. She was preceded in death by father, Billy Frank Moore. Survivors include her husband, Randy Chandler of Hermleigh; three daughters, Brandy (Dutton) Cox of Leander, Trina Chandler and her husband, Gabriel Vasquez, of Snyder, and Tracie Russell and her husband, Jeff, of Republic, Mo. ; one son, Brian Chandler of Springfield, Mo. ; nine grandchildren, Natalie Cox of Leander, Jamison Chandler, Ethan Chandler, Lane Chandler and Haylee Spinabella, all of Springfield, Mo., Brett Baker of Republic, Mo. and Nicole Vasquez, Kayla Vasquez and Sierra Vasquez, all of Snyder; her mother, Dorothy Moore of Grape Creek; one brother, Billy Moore of Orient; one nephew, Cody Moore of Bronte; and special friends, Patricia Park of The Woodlands, Kathy Cooper of Rockdale and Donna Rasmus and Judy Leatherwood, both of Snyder, and Kathy Dean of Kerrville. Memorials may be made to the Leiomyosarcoma Direct Research Foundation, P.O. Box 52697, Tulsa, OK 74152. To send flowers in memory of Sandra Moore Chandler (Moore), please visit our Heartfelt Sympathies Store. Provide comfort for the family of Sandra Moore Chandler (Moore) by sending flowers. Heartfelt Sympathies Store purchased flowers for the family of Sandra Chandler.